Jamie Leno Zimron, 6th dan was in Phoenix for a special seminar the evening of March 22, 2019. Thanks, Jamie Sensei! Of course, you can still pay your ASU dues the old fashioned way - with cash or a check! 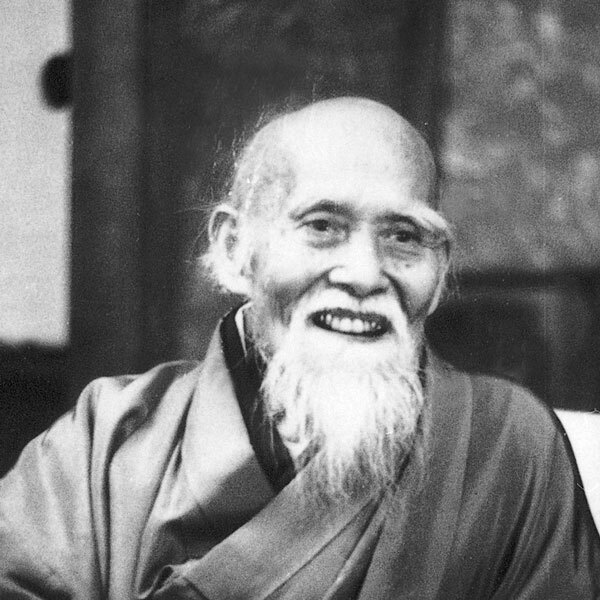 Today, December 14, 2018, we celebrate the birth of O Sensei in 1883. The image on the left is a commissioned drawing that was obtained from Bernie Lau Sensei. 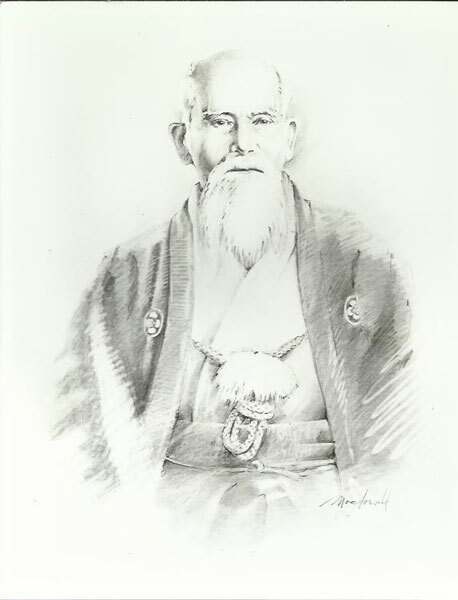 It is a typical pose for portraits of O Sensei in his later life. 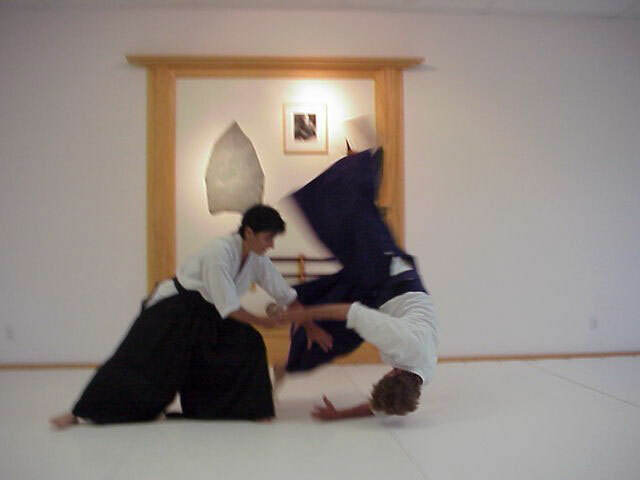 The image on the right is courtesy of Aikido Journal. In honor of his birthday, they've made a collection of O-Sensei videos from Aikido Journal TV available to everyone for free viewing today. Hiroshi Ikeda Shihan has been a strong supporter of Arizona Aikido for more than half of our 50 years of existence! 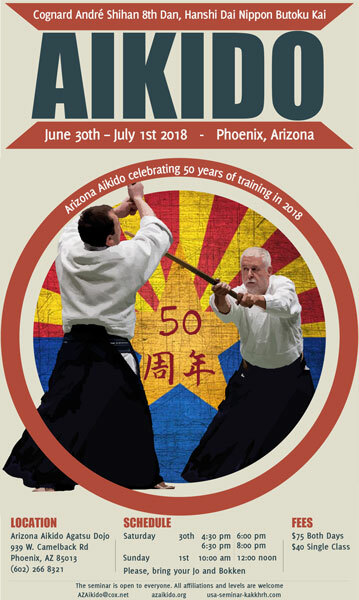 He returns to Arizona Agatsu Dojo December 7-9, 2018, to help us celebrate our 50th anniversary! He is seen in this photo taken at the Asian Arts Center probably sometime in 1987, more than 30 years ago. You may recognize some of the folks in the photo. Click on the photo for a flier. Please don't miss this opportunity to train with Ikeda Sensei. December should be beautiful in Phoenix! If you'd like to check it, here's the Phoenix weather. Friday evening, December 7, 7:00 p.m. to 9:00 p.m.
Saturday afternoon, December 8, 3:00 p.m. to 5:00 p.m.
Sunday morning, December 9, 10:00 a.m. to noon. 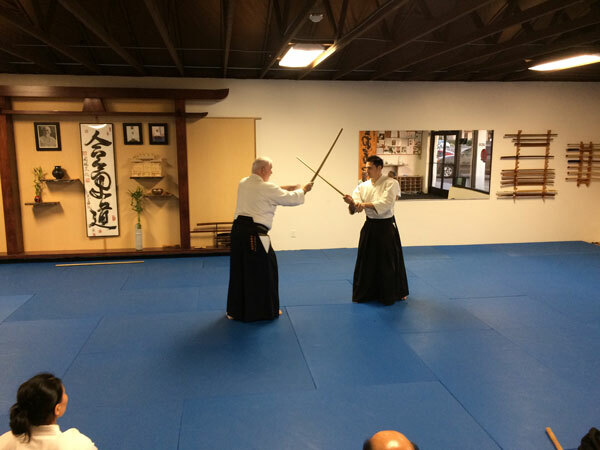 Aikido of Flagstaff is celebrating the Grand Opening of their new dojo, located at 120 S. Beaver St., on Thursday, September 6, 2018, beginning at 4:30 p.m.! Please help them celebrate this new location. 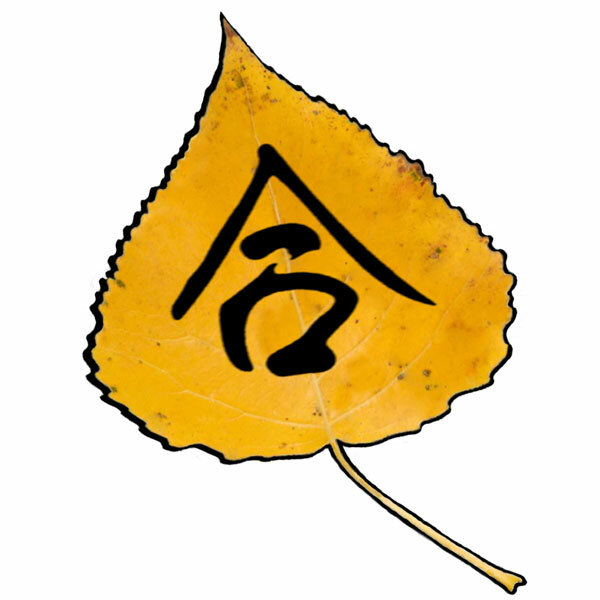 Click on the Aikido of Flagstaff logo for a flier. We remember Sakakibara Sensei fondly on this fifth anniversary of his death. Sakakibara Sensei was very important to Arizona Aikido! 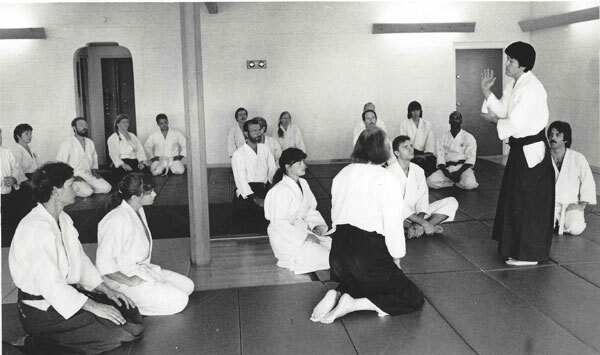 After the death of Jon Takagi Sensei in February 1984, Sakakibara Sensei stepped in to fill the role of Chief Instructor. He held the dojo together, brought us back into union with Hombu Dojo, and kept us training. 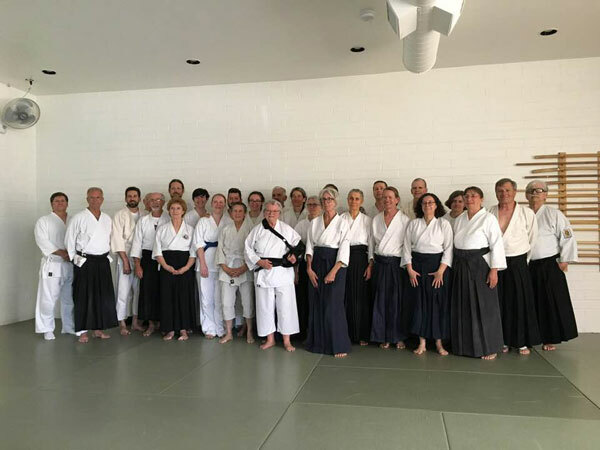 He started the first Fall Mountain Camp in Prescott when he saw the need for us to get away from the Valley, to come together as a family and to grieve the loss of Takagi Sensei. Eventually, he turned the dojo over to Tom Haines Sensei, but continued to teach as as Chief Instructor Emeritus. We still miss him and we honor his memory. Read Sensei's biography here. 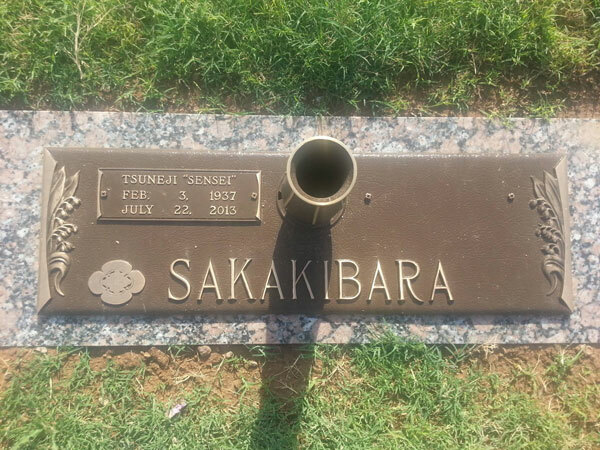 One of the ways we remember him is through the Sakakibara Sensei Memorial Scholarship Fund. If you'd like to donate to the Fund, you may do so using the Donate button below. Thanks to Andre Cognard Sensei for a Great Seminar! Many thanks to André Cognard Hanshi for his visit to Phoenix and his instruction over the two days he was here! We look forward to future opportunities to train with Cognard Hanshi. Arizona Aikido is pleased to welcome Andre Cognard Hanshi, 8th dan, Dai Nippon Butoku Kai to Phoenix for a two-day seminar! Don't miss this opportunity to train with Cognard Hanshi! 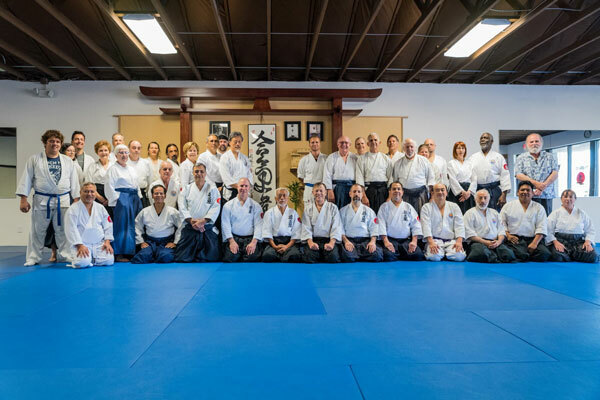 50th Anniversary Celebration with Saotome Shihan! We had a great seminar with Mitsugi Saotome Shihan on May 11-13, 2018, in our new dojo, 939 W. Camelback Rd., Phoenix, AZ 85013! This was our first opportunity to train in the new dojo (Agatsu Dojo) with Saotome Shihan. We are proud to say that he was impressed with the new space! More 50th anniversary celebration seminars are planned in the dojo this year! Please come help us celebrate 50 years in Arizona!